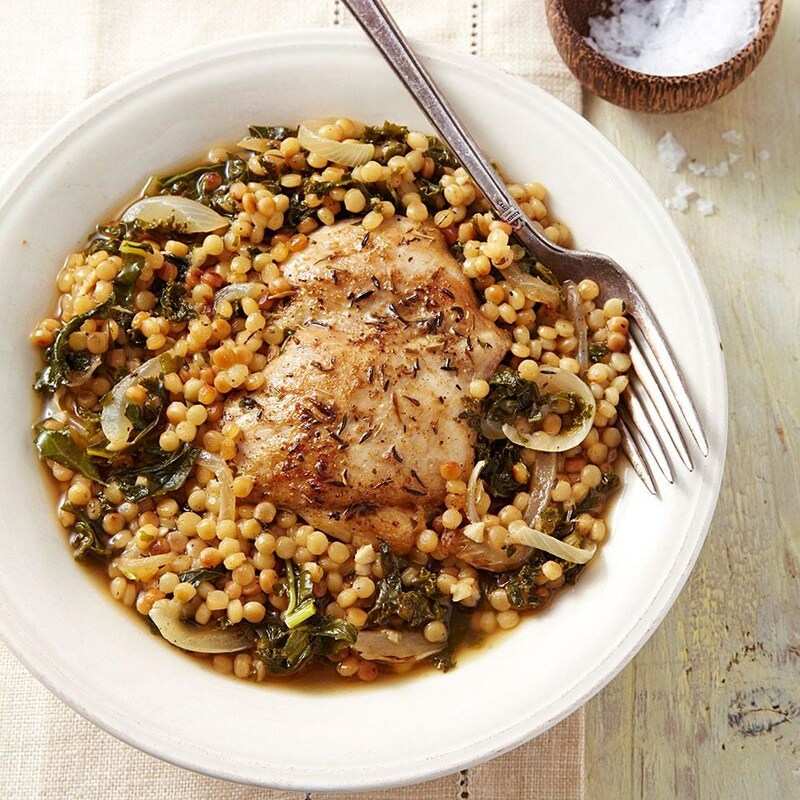 Try whole-wheat couscous for a delicious 5-minute ingredient to add to your meals. Tiny grains of whole-wheat couscous have a knack for absorbing flavors. Couscous is done in a snap—it takes just 5 minutes standing in boiled water, and voilà! Make it a pantry staple at your house and you’ll have an instant base for an easy dinner. Is Couscous a Grain or Pasta? Central to North African cuisine, couscous resembles a grain, but technically is pasta. Traditionally it was formed by rubbing and rolling durum wheat flour and salted water together until it turned into tiny grains, which were dried in the sun. Most couscous in U.S. markets is precooked then dried again, so all it needs is 5 minutes in hot water and it’s ready to eat. You may also find Israeli couscous, but it’s larger, more uniformly round in shape and takes longer to cook, so you can’t swap it for regular couscous in these recipes. Use 1 cup water and 2/3 cup couscous for 4 (½-cup) servings. Instant side: Add frozen peas along with couscous to boiling water. Don’t forget: Fluff it with a fork before you serve it. A 1/2-cup serving of cooked whole-wheat couscous has 70 calories, 0 grams of fat and 2 grams of fiber. Look for couscous near rice and other grains in the super­market. Check for the words “whole-wheat” on the ingredient list to make sure you get an added boost of fiber.